SynOptics is not a name which would would resonate with the younger audience, but they hold an important place in history. We thank them for essentially bringing the world Ethernet on twisted pair cabling. They were one of the first to research, patent and commercialize a 10Mbit/s over twisted pair system named Lattisnet – the precusor to the IEEE standardized 10BASE-T. This was apparently achieved through very careful signal control. Lattisnet appears to have differed from the final 10BASE-T in the sense that it did not have link test pulses. If I remember correctly, there was much skepticism initially surrounding this idea, the prevailing thoughts would be that the signals would merely be radiated into the space and lost without any significant distance being achieved. SynOptics proved them wrong, by producing a system that went 100m between spans. They were in the business of manufacturing “concentrators”, probably better known as hubs nowadays. These provided multiple port access by “repeating” packets all around the network. Their marketing showed that their technology was popular and superior to the thick and thin coax of the time, which operated on a bus-structure and was limited in network length and difficult to troubleshoot. It could operate over existing wiring (10BASE-T only required CAT3 wiring, pretty much the same as twisted phone wiring) and expand easily (with concentrators being allowed to be stacked four-deep). Seeing the utility of the standard, the SynOptics company essentially “set the patent free”, allowing their technology to become the IEEE standard and many other manufacturers to produce interoperable equipment. Thank you SynOptics. Could you imagine a world where people refused to use twisted pair because of a patent dispute? Or maybe one where we had to pay substantial royalties? We deploy unimaginable amounts of twisted pair networks today, and it wouldn’t have been if not for the actions of SynOptics (whose patents would have only expired in 2007!). SynOptics is not often heard of, as they were acquired by Bay Networks, which itself was acquired by Nortel, forming Nortel Networks. Unfortunately, it seems Nortel has gone bankrupt pretty much worldwide (rather unexpectedly), thus all support and historical legacy is gone. It’s truly an end of an era. I managed to collect a SynOptics AUI transciever and a SynOptics LattisHub – which I will explore in the remainder of this post. I suppose that some readers might not be familiar with AUI. AUI stands for attachment unit interface which is a 15-pin interface used in 10Mbit/s networks. This allowed for the Media Access Controller (MAC) to be separated from the Physical Layer (PHY) or Media Access Unit (MAU). This versatility allows for the MAC (which may involve fairly expensive microcontrollers) to be reused regardless of if your network is Fibre, Twisted Pair, Thick Coaxial or Thin Coaxial. Another advantage is that you could use an AUI cable of up to 50m to allow a slightly better positioning of the MAU, which is important in tapped thick-net where spacing of taps was important in insuring signal integrity. Ever since the cost of PHYs reduced due to market volume, and twisted pair became prevalent, the need for AUI connectors became much less, thus they stopped being featured in later 10Mbit/s NICs possibly as a cost cutting measure. 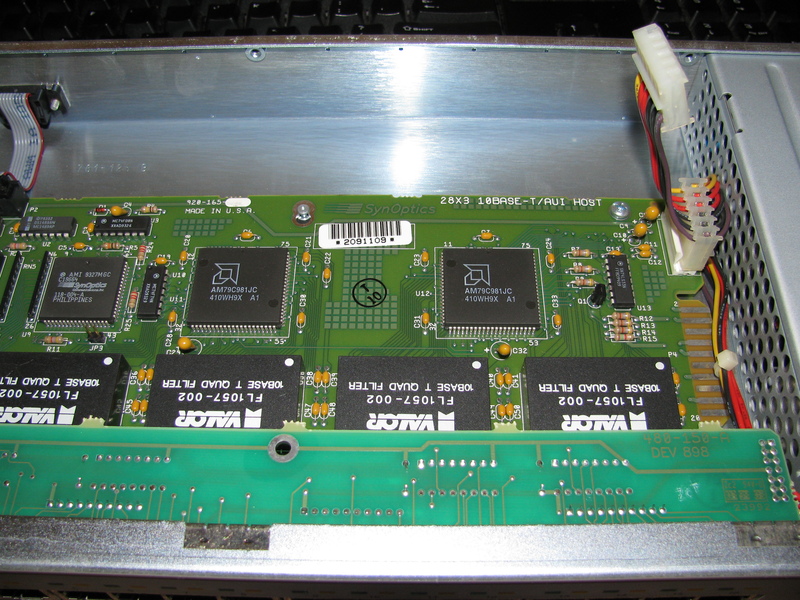 Premium NICs (like the late Intel ISA NIC above) often continued to feature the AUI port, allowing for the most versatility. Many users didn’t need the versatility. Hubs often had one port which allowed for the AUI to hook into the backpane media, which could be fibre, to allow for larger networks to be built. The modern equivalent to the AUI is the Media Independent Interface (MII) or Reduced Media Independent Interface (RMII) for Fast Ethernet (100Mbit/s) or Gigabit Media Independent Interface (GMII) or Reduced Gigabit Media Independent Interface (RGMII) for Gigabit Ethernet (1000Mbit/s). It is likely that the increased signal rates make for difficult interconnections with cables and external ports, so these are never seen externally, and are really only used internally within a product on the PCB to connect a PHY with its MAC – where the MAC may be integrated into a System-on-a-Chip (SoC) or shared with another device. For most instances where you only need a network interface to a popular bus, all-in-one products (i.e. a single PCI to Fast Ethernet chip) are often used. Back to the product itself. It was a pretty sturdy product, and felt like it was completely potted in plastic. This one seems to be dated Week 42 of 1992 and was Made in Hong Kong. It was simple – AUI port in one side, and RJ45 on the other with a fixed length of cable. There was no need for a power supply unlike some other MAUs. The AUI port itself was slightly damaged – the left most pin was bent and flattened. A bit of careful coaxing with a fine pair of pliers managed to straighten it out. Some would recognize such a 15 pin connection as being similar to the one used in a Game or MIDI port on the back of a sound card – which it is. The difference was in the retention clip – instead of using screws, the AUI port used a sliding piece of stamped metal which hooked onto the studs providing retention. The RJ45 plug on the end had lost its retention clip – probably due to some cable-pulling incidents in the past. The wiring shows that only two pairs are connected, the only two pairs required for Ethernet and Fast Ethernet. The rear of the module has a switch for turning SQE on or off. SQE stands for Signal Quality Error and is sometimes known as Heartbeat. It sends the collision signal back through the AUI port after each frame to indicate that the collision detection hardware is operating correctly as a test feature, but needs to be disabled if it is connected to a repeater. Luckily, I still have a few AUI ports lying around on some of my equipment so I could give it a spin. Just so happens that my SynOptics Hub had one! Nicely enough, it was found to work just fine and provided throughput as expected for this “speed” of networking. While this is certainly not one of SynOptics earlier LattisNet equipment, and thus probably not as noteworthy, I do have this one piece of equipment from a disposed lot of ex-Cityrail gear. It was marked as faulty, but it was still operative when tested and donated to me by one of my friends (William). It is a 16-port Ethernet (10Mbit/s) Hub with an AUI, terminal and expansion ports. It features automatic polarity detection and correction for transposed pairs (not even mentioned as a feature in modern switches and NICs). It appears to be a stackable, and certainly rack-mountable hub, with one port switchable uplink. I tried my best to find a manual for it – the closest I got was the 2800 series. It must have been a fairly advanced hub as it seems to have some management capabilities (although I haven’t tried to access them). It also has auto-partitioning to isolate network faults – say a network loop that causes persistent collisions or a faulty network card. Upon testing it with a cable looped from itself to itself (and another pair of cables running data throughput and injecting broadcast packet to make the “storm” happen) – it partitioned the ports almost instantaneously and the storm ceased. Crisis averted. The partitioning continued until the switch was power cycled. Talk about smart! The switch also has a universal input power supply – it would have been a rare sight on this vintage of equipment as switchable voltage ranges or fixed voltage ranges were more common. Date of Manufacture? 21st July 1995. Not early by Ethernet standards, but still not young. And finally, the stacking and management ports … quite simple compared to the high-rate switch fabrics of today’s switches. There’s a lot of empty room, but there’s a board with all the ports and some logic on the front which plugs into the main board. There seems to be a Philips microcontroller/processor (likely x86 judging from the copyright showing through) socketed, an AMI/SynOptics ASIC and a pair of AMD Am79C981 Integrated Multiport Repeater Plus chips. There’s a stack of Valor FL1507-002 10BASE-T Quad Filters (potted modules, likely magnetics for each pair of ports). All in all, it looks quite simple. This is powered by a power supply module (just off the side of the image) with two power plugs (likely for larger 32-port model with two of these boards possibly). There’s also some edge fingers, use unknown. The power supply has multiple approvals and is custom made by Computer Products. Inside, it’s nothing but quality. It looks like it’s gotten a bit warm, but the capacitors are all Nippon-ChemiCon and they all seem to function just fine. The supply is fused and transient suppression caps are all in place. No wonder it still works! I didn’t know about SynOptics until I received their gear – and it’s doubtful I will receive many more of their gear, but their contribution to computer networking in giving up their patent to form an interoperable IEEE standard paved the way for the mass growth in online services we see today. The superior form of networking has just about made coaxial networks extinct. Unimaginable amounts of twisted-pair cabling lurks in houses, schools, universities and datacentres alike. I think it’s important to remember – in all of the rush to grab cash in modern technology, often interoperability (be it in file formats, Bluetooth connection modes, NFC data exchange sets, IM and file sharing protocols, OS boot processes) is often sacrificed as a form of “vendor lock in”. It is a way to try and gain a competitive edge against your rivals, but it also causes waste and inconvenience in the long run. People may have to convert files, resort to “sneaker-net” file transfers, or install new apps just to make things happen. Setting your standard free may not make you a lot of money, but it certainly makes you a good person and solves these problems. It even opens it up for improvement by all for all – it’s almost like “open sourcing” the technology. If more companies were to embrace such ideas – we would not have such hell when it comes to digital archaeology in opening old files (and in the future, files we are creating today). It wouldn’t be such hell to try and get other OSes onto the hardware you bought. This entry was posted in Computing, Telecommunications and tagged networking, teardown, vintage stuff. Bookmark the permalink. I have to stop reading your blog LOL! You bring back too many memories. I worked with this hardware back when it was called LattisNet. To be honest, I too could not see how it would work having been conditioned to use coaxial cable both in ThinNet and ThickNet and all the warnings associated with it having to be perfect. Still it did work and work well. Unfortunately, Synoptics LattisNet was not compatible with the 10Base-T standard and we wound up having to scrap our LattisNet hardware for 10Base-T compliant hardware (also from Synoptics). Frankly the stupidest thing Synoptics did was to merge with Wellfleet to create Bay Networks. The corporation I worked for back in the early 1990’s had standardized on Synoptics hardware but Bay’s offerings did not impress us and we looked elsewhere for solutions. I guess many other users of Synoptics equipment felt the same way. Thanks very much for your informative, nostalgic comments! I enjoyed reading them greatly. Apologies for the issues with the commenting system – receiving an error is no problem as the comment has been received by the server, but it seems that a conflict between my web host’s settings and the comment system is to blame. Thanks, very interesting…there is very few information in the net about LattisNet devices.. Is that LattisHub 10Base-T compatible – does the network work when you connect modern 10/100base-T computers to that hub? As far as I know the Lattishub I have is not part of the original LattisNet series. This one does interoperate at 10Mbit/s with modern Ethernet cards – I have tested it myself. I have a Synoptics model 928. I am not sure if it works or what I am going to do with it. Does it have any value? It seems a shame to scrap/recycle it.